Online mega-retailer Amazon.com has announced that it’s Kindle for iPhone application for the Apple iPhone and iPod touch is now available in more than 60 additional countries, enabling users to not only buy and download books from the Kindle Store, but also synchronize their reading to Amazon’s Kindle devices and tap into their library of purchased titles from Amazon’s servers. And, unlike the physical Kindle devices, Kindle for iPhone can show some titles in color, including travel books, graphic novels, and more. Users can also read the beginning of a book before purchasing. The application is available as a free download from the iTunes App store in supported markets. So far, Amazon is the clear leader in the e-reader market: although Sony was the first out the door, the Kindle has been on the market for two years, and while Amazon does not divulge specific sales figures for the device, it recently claimed November was the device’s best sales month ever. 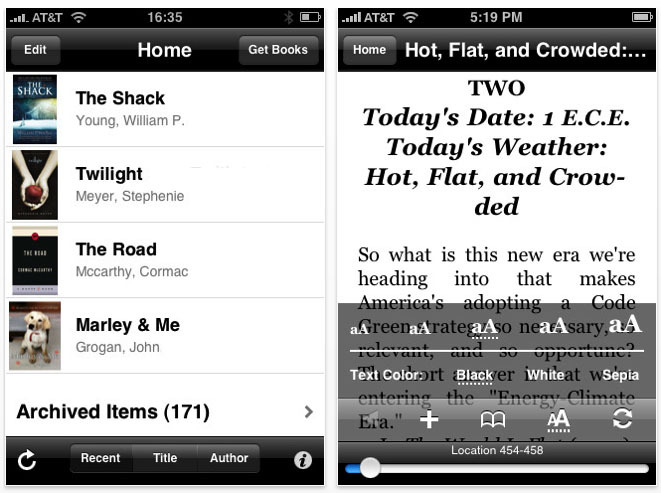 In addition to the iPhone app, Amazon also offers a Kindle application for PCs.